Houston, we've finally got a Shuttle launch, social media style. 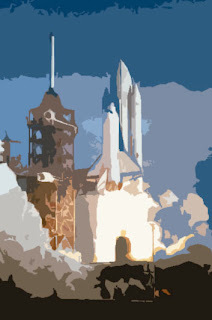 The launch of STS-129 is scheduled to happen in about 1.5 hours (11:28AM PST/ 19:28PM UTC), but the excitement is happening now via webcast at SpaceflightNow.com and at a #NASATweetup happening at Cape Canaveral. Spaceflightnow.com has put together an amazing webcast team, hosted by Miles O'Brien, David Waters, and Astronaut Leroy Chiao (one of the first astronauts to join Twitter!). The webcast is filled with interviews and fascinating facts about the Space Shuttle, the mission, and the crewmembers. The webcast is paired with a NASA Tweetup event taking place at the Cape for the launch. With the interest and buzz that this event has generated so far, I think we can breathe a sigh of relief knowing that this may emerge as a new standard for launch coverage in the future. If you're not following along, join the excitement by following the #nasatweetup hashtag on Twitter, or tune into SpaceflightNow.com for live coverage. SpaceVidCast is also providing live HD coverage of the launch on Ustream. Exciting stuff, seeing hundreds of people engaged and learning about spaceflight in real time. Godspeed to Atlantis and her crew!